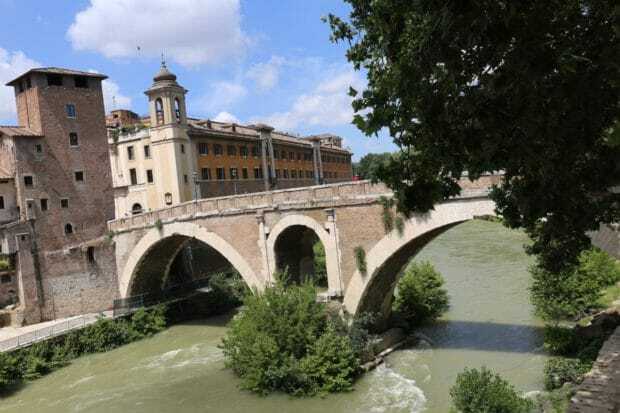 Since its foundation over 2,760 years ago on seven hills near the banks of the River Tiber, Rome has grown into a city of three million people. Its history can be traced in the crumbling columns of the ancient empire, the medieval alleys, Renaissance palaces, Baroque fountains, and elegant piazzas. 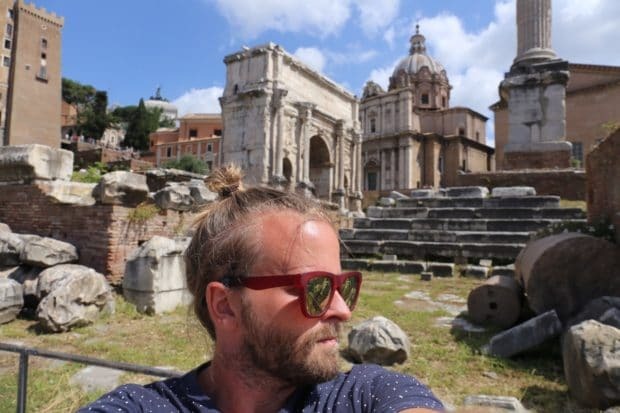 I’ve had to sheepishly inform my travel chums over the years, “I’ve yet to conquer Rome,” a travel writers blasphemy, so was thrilled to finally plan my first trip to the Italian capital this summer. Whether here for several days or just wanting a flavour of this great city, you need to make the most of your time. 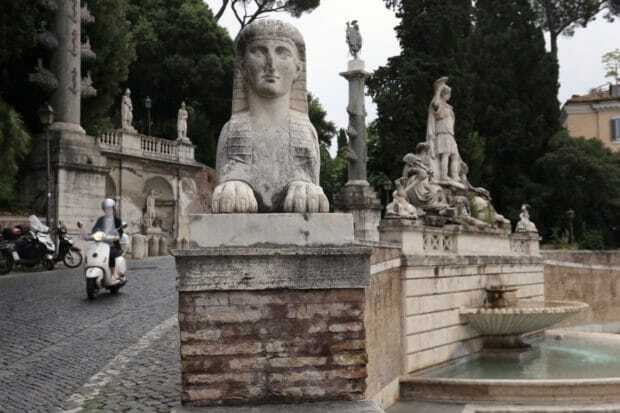 I researched my trip in advance using Eyewitness Travel Top 10 Rome (DK Publishing, 2016), sketching out a four day itinerary which would have me wandering through the Eternal City with ease while taking in top attractions and nibbling through famed local delicacies. The handy travel guide is an essential read for those planning their first trip as it outlines which attractions you need to book in advance (Borghese Gallery) and how to take advantage of the museum hopping Roma Pass (which also includes free public transit for the win). Size: super thin and packed full of useful quick tips. Easily slips into your pocket or camera bag while running around the city. Includes Map: in the books back pocket you’ll find a detachable waterproof map which comes in handy when you’re running around on a rainy day. 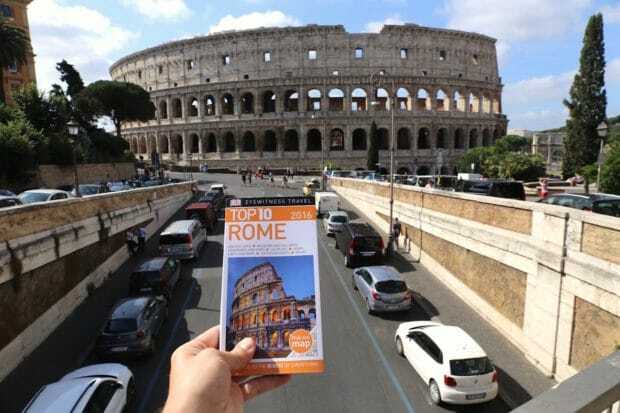 Great Top 10 Lists: the first few chapters of the book are dedicated to the Top 10 most visited attractions in Rome while the remaining are niche lists which are handy for those who have unique interests. Examples include Ancient Sites, Early Christian Churches and Artistic Masterpieces. Insider Tips: the guide is full of useful insider tips and tricks which answer a lot of great questions you might not even think to ask. Where and when am I most likely to see the Pope? What time of day is it best to visit the Roman Forum? How do I reserve tickets in advance to Galleria Borghese? If you’re looking for chic boutique accommodation in the centre of the city be sure to book a sweet suite at The Blue Hostel. Located a 2 minute walk from Termini Train Station and a stones throw from Santa Maria Maggiore, The Blue Hostel offers well seasoned travellers an intimate experience in the heart of the Italian capital. 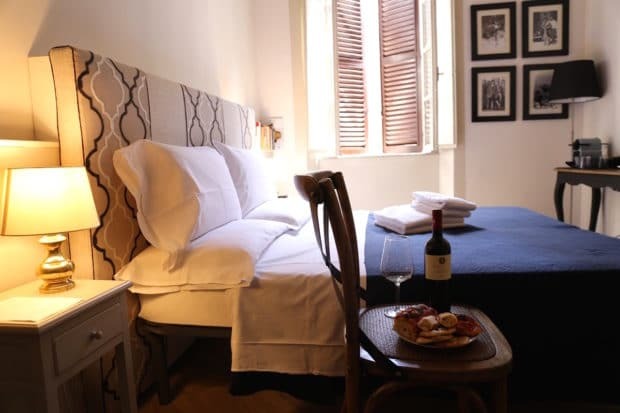 Blue Hostel is located in a heritage building, protected by The Soprintendenza dei Beni Culturali as it’s built over Roman basements and was used as a convent up to 200 years ago. While restoring the apartment the owners preserved its original features: 200 year old original ceilings, antique room doors and large windows. The headboards are single pieces handmade in Orvieto by a famous local artisan and the wardrobes are designed by Architect Panzini and crafted in Rome. The vintage photos that hang in each room showcase the owner’s own intimate family pictures. Amenities include a comfy Queen, coffee maker, TV, selection of Italian books, mini fridge and lavender mint scented bath products by C.O. Bigelow Apothecaries. Rome’s greatest amphitheatre was commissioned by Emperor Vespasian in AD 72 on the marshy site of a lake in the grounds of Nero’s palace. Deadly gladiatorial combats and wild animal fights were staged by the emperor and wealthy citizens for public viewing, free of charge. The Colosseum was built to a practical design, with its 80 arched entrances allowing easy access for 55,000 rowdy spectators. If you’re visiting during the high season pop by in the morning when the temperatures are more reasonable and use your Roma Pass to skip the line. The Forum was the centre of political, commercial, and judicial life in ancient Rome. The largest buildings were the basilicas, where legal cases were heard. According to the playwright Plautus, the area teemed with “lawyers and litigants, bankers, and brokers, shopkeepers and strumpets, good-for-nothings waiting for a tip from the rich.” As Rome’s population boomed, the Forum became too small. In 46 BC Julius Caesar built a new one, setting a precedent that was followed by emperors from Augustus to Trajan. 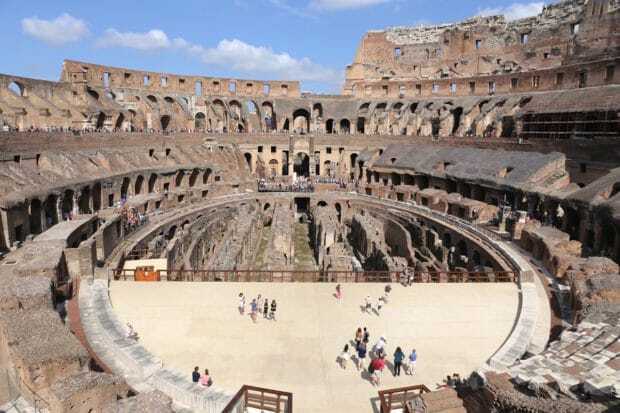 To appreciate the layout of the Forum before visiting its confusing patchwork of ruined temples and basilicas, it is best to view the whole area from above, from the back of the Capitol. From there you can make out the Via Sacra (the Sacred Way), the route followed through the Forum by religious and triumphal processions toward the Capitol. Up until the 18th century, when archaeological excavations began, the Arch of Septimius Severus and the columns of the Temple of Saturn lay half-buried underground. Excavation of the Forum continues, and the ruins uncovered date from many different periods of Roman history. Italy’s infamous aperitif is light in alcohol at only 11% ABV, but has a rich and complex taste from the infusion of a blend of high-quality herbs, roots, sweet oranges and rhubarb. Most often enjoyed as a classic Apertol Spritz cocktail before the dinner hour featuring 1 oz Aperol, 2 oz Prosecco, splash of soda and a juicy orange slice. 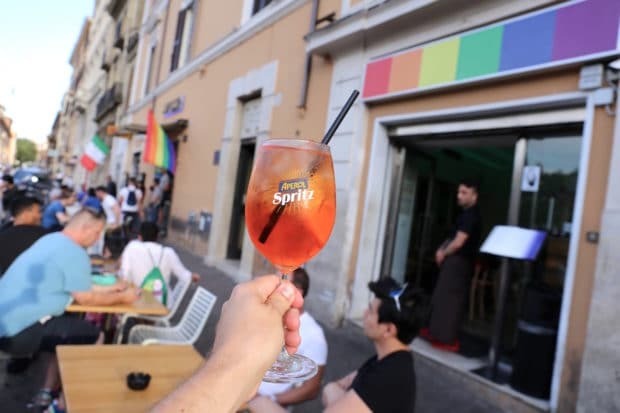 Rome’s rainbow adorned gaybourhood is located on a wee street directly beside the Colosseum. Grab a seat on the patio at Coming Out and quench your thirst from one of the city’s best spots to people watch. 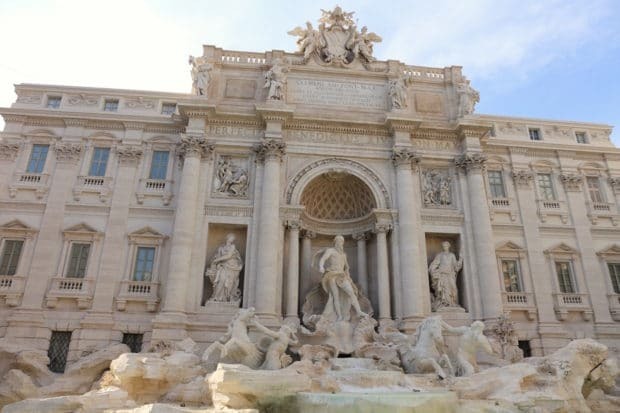 Most visitors gathered around the coin-filled fountain assume that it has always been here, but by the standards of the Eternal City, the Trevi is a fairly recent creation. 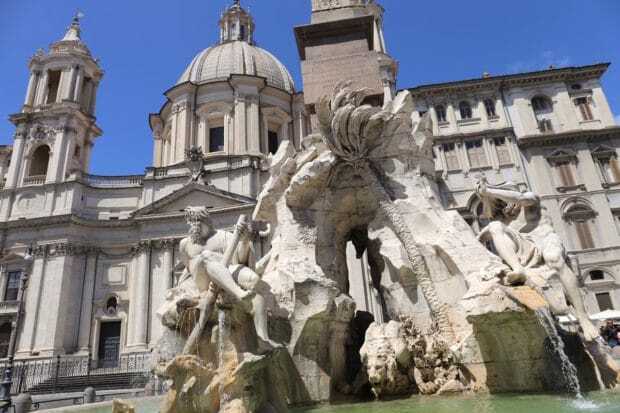 Nicola Salvi’s theatrical design for Rome’s largest and most famous fountain was completed only in 1762. The central figures are Neptune flanked by two Tritons. One struggles to master a very unruly “sea horse,” the other leads a far more docile animal. These symbolize the two contrasting moods of the sea. The site originally marked the the terminal of the Aqua Virgo aqueduct built in 19 BC. One of the first-story reliefs shows a young girl (the legendary virgin after whom the aqueduct was named) pointing to the spring from which the water flows. 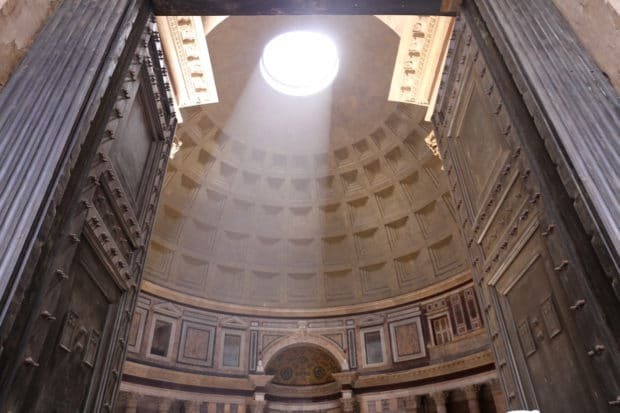 In the Middle Ages, the Pantheon, the Roman temple of “all the gods,” became a church; in time, this magnificent building with its awe-inspiring domed interior became a symbol of Rome itself. The rectangular portico screens the vast hemispherical dome: only from inside can its true scale and beauty be appreciated. The rotunda’s height and diameter are equal. The hole at the top of the dome, the oculus, provides the only light. We owe this marvel of Roman engineering to the emperor Hadrian, who designed it (AD 118-125) to replace an earlier temple built by Marcus Agrippa, son-in-law of Augustus. The shrines that now line the wall of the Pantheon range from the tomb of Raphael to those of the kings of modern Italy. The French national church was founded in 1518, but it took until 1589 to complete with contributions by Giacomo della Porta and Domenico Fontana. The church serves as a resting place for many illustrious French people including Chateaubriand’s lover Pauline de Beaumont. Three Caravaggios hang in the fifth chapel on the left, all dedicated to St. Matthew. Painted between 1597 and 1602, these were Caravaggio’s first great religious works: the Calling of St. Matthew, the Martyrdom of St. Matthew and St Matthew and the Angel. The first version of this last painting was rejected because of its vivid realism; never before had a saint bene shown as a tired old man with dirty feet. The foundations of the buildings surrounding the elongated oval of Piazza Navona were the ruined grandstands of the vast Stadium of Domitian. 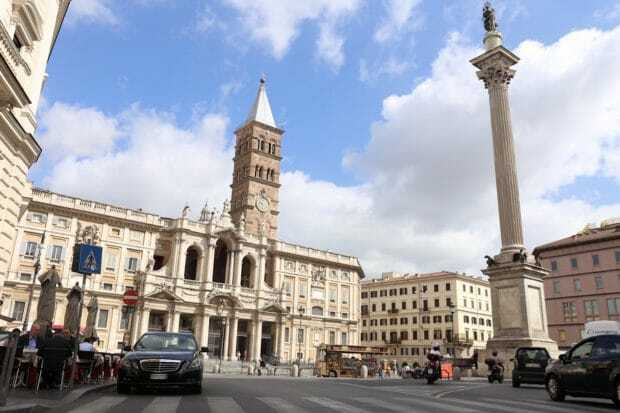 The piazza still provides a dramatic spectacle today with the obelisk of the Fontana dei Quattro Fiumi in front of the church of Sant’Agnese in Agone as its focal point. 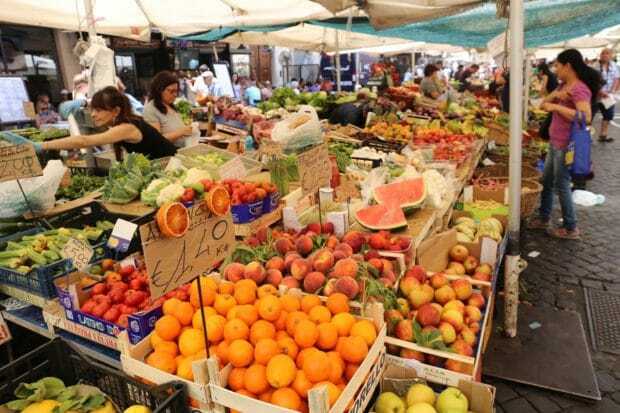 The open-air market of Campo de’ Fiori preserves the lively, bohemian atmosphere of the medieval inns that once flourished here, while the area also contains Renaissance palazzi, such as Palazzo Farnese and Palazzo Spada, where powerful Roman families built their fortress-like houses near the rout of papal processions. “The Field of Flowers,” occupies what was, in ancient times, the open space in front of the Theatre of Pompey. Since the Middle Ages, it has been one of Rome’s liveliest areas, a backdrop for princes and pilgrims alike. Today foodies head here for the spectacular market where fresh seasonal produce, spicy cured meat, hand-rolled pasta and a heavenly assortment of cheese are sold on cobblestone streets. The proud and aggressively independent inhabitants of Trastevere, the area “across the Tiber,” consider themselves the most authentic Romans. In one of the most picturesque old quarters of the city, it is still possible to glimpse scenes of everyday life that seem to belong to bygone centuries. There are, however, signs that much of the earthy, proletarian character of the place may soon be destroyed by the proliferation of fashionable clubs, restaurants and boutiques. Some of Rome’s most fascinating medieval churches lie hidden away in the patchwork of narrow, cobbled back streets, the only clue to their location an occasional glimpse of a Romanesque bell tower. Of all the great Roman basilicas, Santa Maria has the most successful blend of different architectural styles. Its colonnaded nave is part of the original 5th century building. The Cosmatesque marble floor and delightful Romanesque bell tower, with its blue ceramic roundels, are medieval. The Renaissance saw a new coffered ceiling, and the Baroque gave the church twin domes and its imposing front and rear facades. The mosaics are Santa Maria’s most famous feature; from the 5th century come the biblical scenes in the aisle and the spectacular mosaics on the triumphal arch. 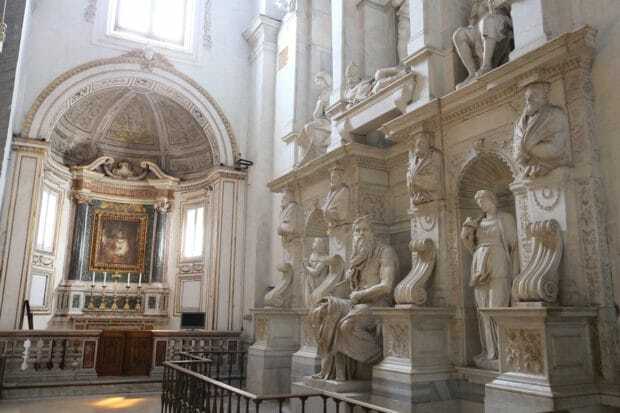 The unassuming San Pietro in Vincoli is best known for Michelangelo’s Tomb of Pope Julius II. 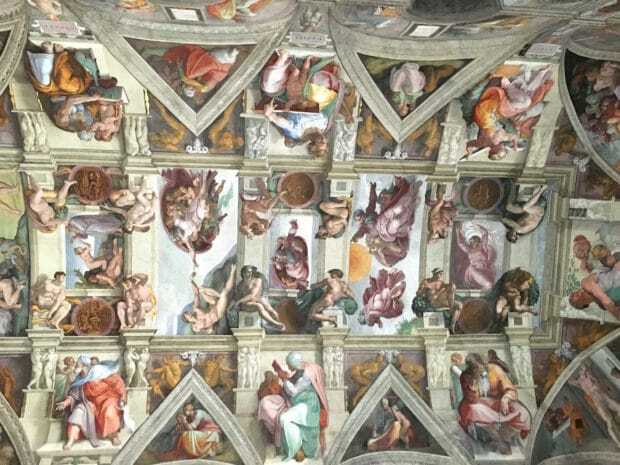 When it was commissioned in 1505, Michelangelo spent eight months searching for perfect blocks of marble at Carrara in Tuscany, but Pope Julius became more interested in the building of a new St. Peter’s and the project was laid aside. Michelangelo had planned a vast monument with over 40 statues, but the tomb that was built – mainly by his pupils – is simply a facade with six niches for statues. The Dying Slaves are in Paris and Florence, but the tremendous bearded Moses is here. 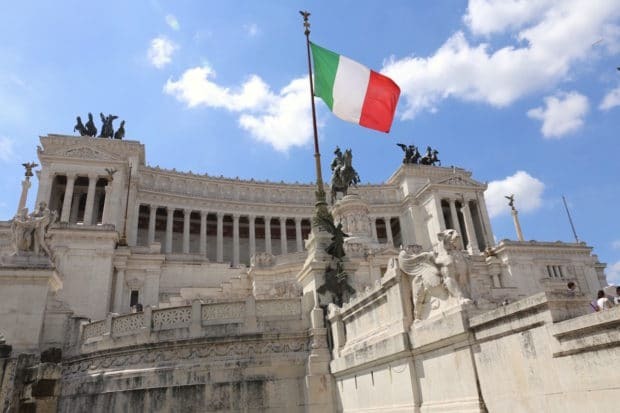 The Altare della Patria (Altar of the Fatherland) is a monument built in honour of Victor Emmanuel, the first king of a unified Italy. The eclectic structure was designed by Giuseppe Sacconi in 1885; sculpture for it was parcelled out to established sculptors all over Italy, such as Leonardo Bistolfi and Angelo Zanelli. The king is depicted here in a gilt of bronze equestrian statue, oversized like the monument itself – the statue is 12 metres long! When the Holy Roman Emperor Charles V visited Rome in 1536, Pope Paul III Farnese was so embarrassed by the muddy state of the Capitol that he asked Michelangelo to draw up plans for repaving the piazza, and for renovating the facades of the Palazzo dei Conservatori. Building started in 1546 but progressed so slowly that Michelangelo only lived to oversee the double flights of steps at the entrance of Palazzo Senatorio. The piazza was completed in the 17th century, the design remaining largely faithful to the original. Ancient Rome’s religious heart, Capitoline Hill now houses a magnificent museum. 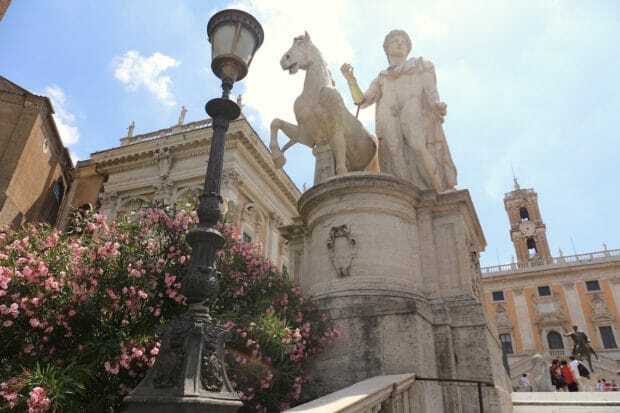 Take the Cordonata uphill and at the top you’ll find find a statue of Marcus Aurelius in a star-shaped piazza, which is bordered by twin palaces containing some of Rome’s greatest treasures. The collections in the Palazzo Nuovo and Palazzo dei Conservatori were established in 1471 with a donation of bronzes by Pope Sixtus IV and is considered to be the world’s first public museum. 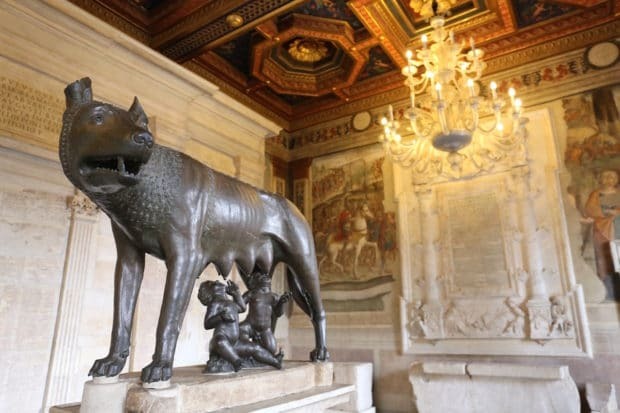 Highlights from the collection include the reclining Marforio, the iconic Bronze She-Wolf from the 5th century and a fantastic serpentine bust of Medusa. Dating from 1568, the Gesu was the first Jesuit Church to be built in Rome. Its design epitomizes Counter-Reformation Baroque architecture, and has been much imitated throughout the Catholic world. The layout proclaims the church’s two major functions: a large nave with side pulpits for preaching to great crowds, and a main altar as the centrepiece for the celebration of the Mass. The illusionistic decoration in the nave and dome was added a century later. Its message is clear and confident: faithful Catholic worshippers will be joyfully uplifted into the heavens while Protestants, and other heretics, are flung into the fires of Hell. The Vatican, a centre of power for Catholics all over the world and a sovereign state since February 1929, is ruled by the pope. Four centuries of papal patronage and connoisseurship have resulted in one of the world’s great collections of Classical and Renaissance art. The awe inspiring and spectacularly massive Vatican Museums house many of the great archaeological finds of central Italy, including the Laocoon group, the Apollo del Belvedere, and the Etruscan bronze known as the Mars of Todi. Visitors have to follow a one-way system so it is best to concentrate on a single collection. You can spend anywhere from 90 minutes to several days wandering through the hallways here. 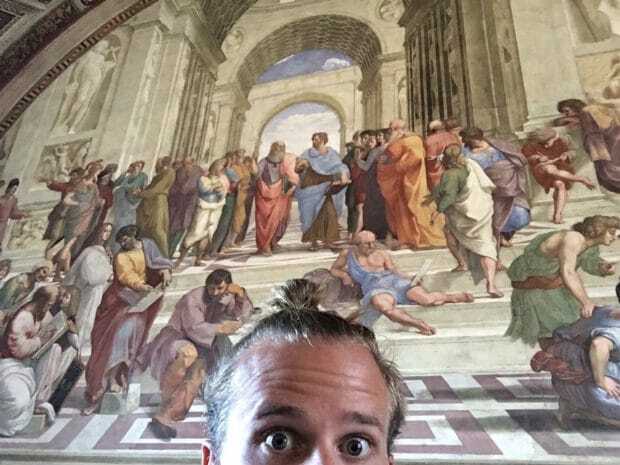 Be sure to linger in the Raphael Rooms to take a selfie, they really are spectacular! 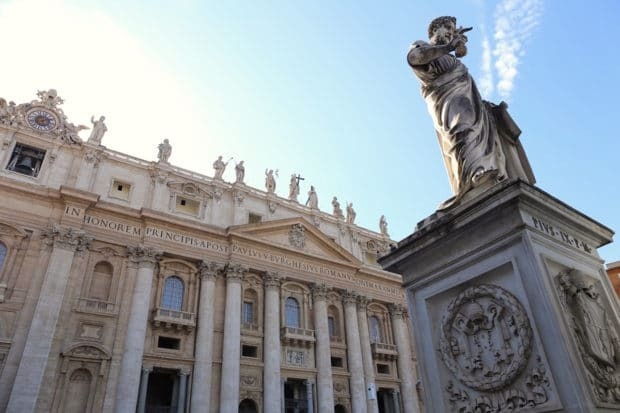 The centre of the Roman Catholic faith, St. Peter’s draws pilgrims from all over the world. Few are disappointed when they enter the sumptuously decorated basilica beneath Michelangelo’s vast dome. The vast basilica’s 615 ft-long, marble–encrusted interior contains 11 chapels and 45 altars and a wealth of precious works of art. 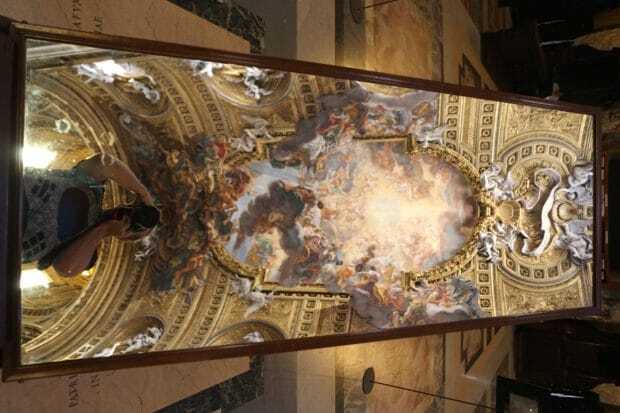 Some are salvaged from the original basilica and others commissioned from late Renaissance and Baroque artists, but much of the elaborate decoration is owed to Bernini’s mid-17th century work. Highlights include Michelangelo’s Pieta, Bernini’s Baldacchino and Raphael’s Annunciation. A vast cobbled oval standing at the apex of the triangles of road known as the Trident, Piazza del Popolo forms a grand symmetrical antechamber to the heart of Rome. Twin Neoclassical facades stand on either side of the Porta del Popolo and an Egyptian obelisk rises in the centre. Over 300 years old, the obelisk was originally brought to Rome by Augustus to adorn the Circus Maximus after the conquest of Egypt. Be sure to pop into Santa Maria del Popolo, one of Rome’s greatest stores of artistic treasures. Among the early Renaissance artists who worked on the building were Andrea Bregno and Pinturicchio. Later additions were made by Bramante and Bernini. 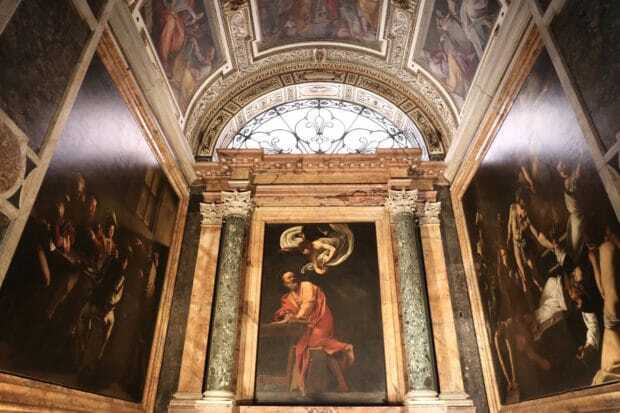 Once you’ve arrived its hard not to miss the big draw (follow the crowds) as two Caravaggio masterpieces hang in the Cerasi Chapel: The Conversion of St. Paul and The Crucifixion of St. Peter.